Memory, music and imagery blend to create a symphony of artistry and emotion in The Pianist of Willesden Lane at Hartford Stage. Mona Golabek stars as her mother, pianist Lisa Jura, who escaped pre-war Vienna on the Kindertransport. Hershey Felder, who directs, adapts the play from Golabek's book "The Children of Willesden Lane," cowritten by Lee Cohen. Surrounded by large golden picture frames used to show family photos, locations and video footage to compliment the story (set design by Trevor Hay and Hershey Felder; Projection Design by Andrew Wilder and Greg Sowizdrzal), Lisa shares her story, beginning as a young girl in 1938, eager for her next piano lesson. Her dream is to one day play a Grieg concerto at Carnegie Hall. Things are different, that day, however, as she arrives at her beloved piano teacher's home. The street has been changed from a Jewish to a German name, soldiers are everywhere and a law has been passed making it illegal for him to teach Jews. 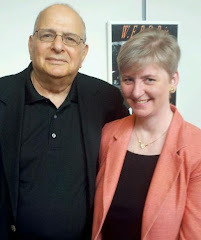 Her father, struggling to support the family, plays poker and wins a ticket for the Kindertransport, a rescue effort to help Jewish children escape to Great Britain by train. Her parents must choose from among their three daughters and select Lisa, who is quickly separated from her family and sent to various places in London, where she works in factories and longs for news from her family. At one of the hostels on Willesden Lane, where she is one of many children working by day and hiding in the basement during bombing raids at night, the woman in charge recognizes her extraordinary gift at the piano. Her friends urge her to audition for a scholarship at the Royal Academy of Music, where she is able to continue studying the piano. Later she makes her way to America. 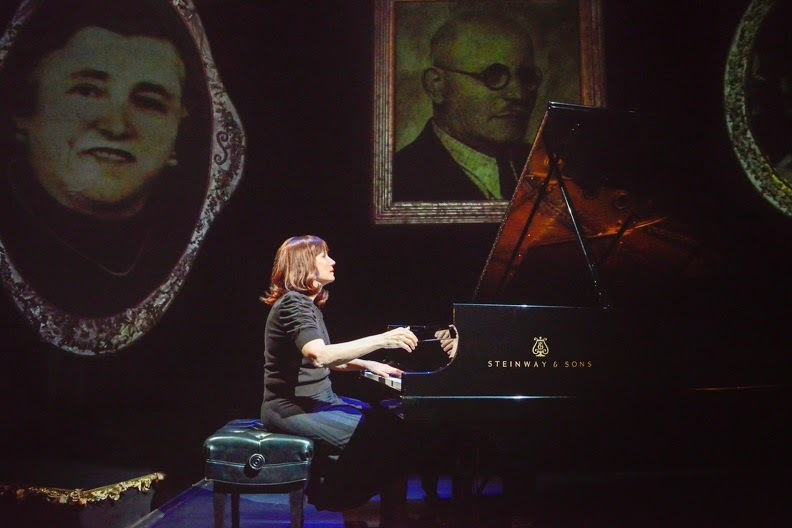 As Lisa tells her story, which continues through 1942, the music she plays at the piano (and yes, that's really Golabek mesmerizing at the grand Steinway center stage) mimics the activities and emotions she experiences. We recognize the buzz of sewing machines in the factory, or the bombs dropping on London in beautifully played music that give new meaning and depth to classical pieces we have hear thousands of times before. Extraordinary sound effects (designed by Erik Cartensen) allow us to hear street noise, the chaos and horror of Kristallnacht, the bombing raids on London and a full symphony orchestra playing behind Lisa as she executes her beloved Grieg Piano Concerto in A Minor (as well as Beethoven, Chopin and other pieces). The gripping 90-minute, no-intermission drama transports us to another time and place and into the heart of a daughter lovingly recreating the memories of her mother. All elements are in harmony and Golabek's incarnations as the various characters in the tale are made more charming by a stiffness -- a delightful lack of stage polish -- which remind us this is the sharing of a real, very personal story which we have been privileged to hear and not just a performance. Golabek offers some personal comments to the audience after the performance and the night I attended, she signed books in the lobby, so we really could get up close and personal. Hartford Stage recommends the show for ages 12 and up. Every junior and senior high school student should experience this glimpse into history. Student tickets are just $20. Tickets are $25 to $85: 860-527-5171; hartfordstage.org. The Pianist of Willesden Lane plays through April 26 at Hartford Sage, 50 Church St., Hartford.